After the morning riding tandems and playing VI cricket, the Aniridia Network UK Meeting 2016 moved to nearby Holy Trinity church. Sitting down to for lunch gave us all more opportunities to chat, meet up with and make new friends. Trustee James welcomed everyone, gave some orientation tips and then introduced the expert presenters. Dr Jane Leitch spoke about the less often discussed effects of abnormalities in the PAX6 gene that usually causes aniridia. Debbie, the ANUK Daily Living Advsier gave an interesting insightd into the work of a mobility professional as well as a person with aniridia. We were then treated to the next instalment of Harry Westwood’s story, since he talked at the ANUK Conference 2014, he has started university. Harry highlighted the everyday challenges he faced in living independently from catering for himself to navigating a strange campus. Next was the formal part of the conference, the Aniridia Network Annual General Meeting 2016 including the Annual Report 2015/16. The current trustees were re-elected. After the AGM, we were encouraged to write a pledge on a positit of something, large or small, that we could do to help keep ANUK running in the future. Everything the charity does is done by volunteers, from the fundraising so that events like the conference can be held to the everyday administration of running a charity. During the break delegates could chat and browse the exhibition in the atrium. A share of the profits from the commercial stalls was donated to ANUK. For the first time at our events, our Medical Adviser provided an opportunity for informal consultations for patients and family members. The second half offered a choice of talks. In one room was Daniel from Nystagmus Network and Jenny representing Blind Children UK. Meanwhile in the main hall was Emily who has aniridia, talking about her: life, campaigning and politics. James bought the meeting to a close. We showed our appreciation for the all the coaches, riders, chefs, speakers, exhibitors and other volunteers for all their hard work to stage the event that made it such a success. There had been a fundraising quiz. The winners of collected their prizes. Several delegates adjourned to the local pub to continue swapping experiences. “I enjoyed the talks and chatting to others and it was great to feel included and in a group rather than feeling alone. My son was buzzing on the way home as he had never met anyone with aniridia and he now wants to help raise awareness and funds. 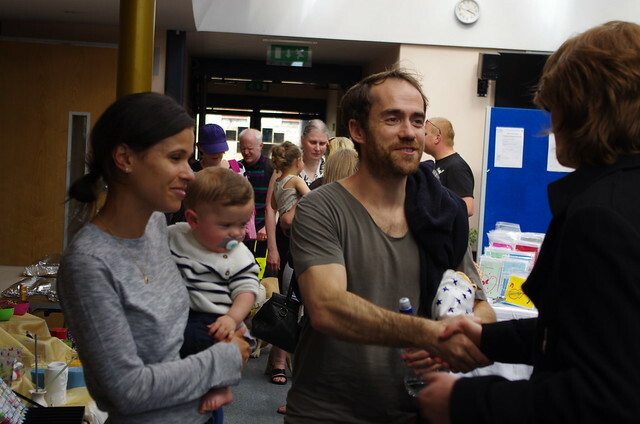 He really enjoyed speaking to new parents of a 6 month old boy as he felt he could reassure them that his life had been great and aniridia was a part of him but it hadn’t defined him. Back in the church hall there was a big 60th birthday party for Mary, the event co-organiser. There were a variety of fundraising activities in aid of ANUK and Guide Dogs Association. The grand total raised for ANUK was £380! A massive thank you goes to everyone who attended and contributed to the wonderful day for everyone. This entry was posted in ANUK news and tagged conference, conference 2016, event, meeting. Bookmark the permalink.